If you have a knack for shooting with the camera slightly misaligned with respect to the horizon, your Nikon D5200 can help you straighten out. Photos like the one on the left in the figure often wind up crooked — in this case, everything tilts down toward the right corner of the frame. Your inability to “shoot straight” might make you especially fond of the Straighten tool on the Retouch menu. With this filter, you can rotate tilting horizons back to the proper angle, as shown in the right image in the figure. You can rotate crooked photos back to a level orientation with the Straighten tool. 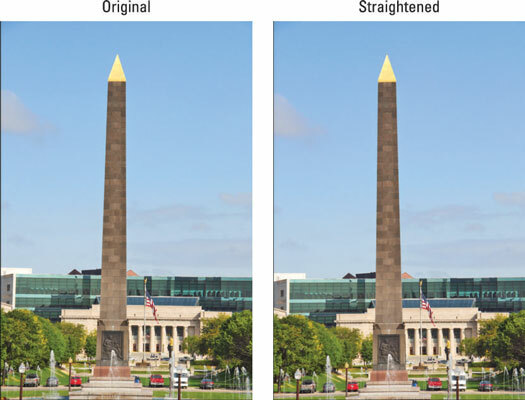 To achieve this rotation magic, the camera must crop your image and then enlarge the remaining area — that’s why the after photo contains slightly less subject matter than the original. (The same cropping occurs if you make this kind of change in a photo editor.) The camera updates the display as you rotate the photo so that you can get an idea of how much of the original scene may be lost. Highlight Straighten, as shown on the left in this figure, and press OK.
You see a screen similar to the one on the right in the figure, with a grid superimposed on your photo to serve as an alignment aid. Press the Multi Selector right or left to rotate the image in increments of .25 degrees. To rotate the picture counterclockwise, press the Multi Selector left. When things are no longer off-kilter, press OK to create your retouched copy.